Recently released, the Habu Gaming Mouse is billed as a fusion of Razer brand precision with Microsoft comfort, combined to get the best of both worlds. Razer have long been producing gaming-specific hardware, and you can see their influence heavily in the design of this mouse. While the case is a jet black version of the popular Intellimouse Explorer 3.0, the buttons are a Razer design of oversized rubber. There are also Razer-esque glowing fins running along the sides and around the back, which shimmer blue when the mouse is plugged in. 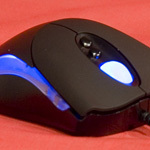 The mouse wheel, while a traditional vertical-only model with indents, also glows a pleasing blue. Just behind the wheel are two buttons that let you adjust the DPI by default, but can be reconfigured with other functions if needed. The Habu has two further buttons placed on the left side of the mouse as with the IE3.0. Microsoft also decided to make this side panel customisable with two different layouts for the buttons. By hitting a small square button on the underside of the mouse the side panel falls away and you can quickly replace it with the alternative layout. The difference between the two panels is the position of the buttons, one set towards the front and the other further back. The Teflon feet of this mouse are very like Razer's recent feet on the Diamondback and Copperhead: small and angular at the front, round and sweeping at the back. 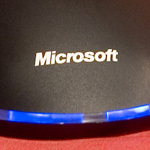 Microsoft even throw in a spare set of mouse feet in case the originals get worn out. 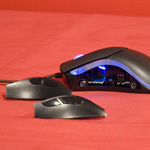 This is the first mouse I tested that has changable DPI, from 400 up to the maximum of 2000. I discuss DPI in more detail on Page 2, including whether making it changable on the mouse is useful for gaming. To perform the benchmarking I began at the maximum value of 2000 DPI. Perfect Control ends at 1.04 m/s (41"/s). Unlike the MS Laser 6000, the Habu response falls off more slowly after this. The Malfunction Speed is at 1.15 m/s (45"/s). As with the Laser 6000, I made sure that the mouse was clamped firmly in contact with the mousepad as the laser sensor stops functioning as soon as you lift the mouse from the surface. The resolution measured from the response graph works out as 2000 DPI, as expected. I tried repeating the benchmark at a lower sensitivity setting on the mouse. I found out pretty quickly that there was absolutely no difference in the response graph except for the scaling. Reducing the DPI simply scales down the response but doesn't affect the performance at all. Therefore I am not including graphs for different DPI values, as they are identical except for multiplying the response amount. 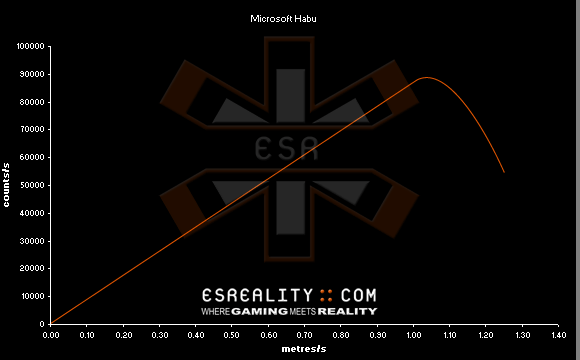 The Habu is an awesome looking mouse, and anyone used to Microsoft ergonomics will feel right at home with the shape. You can customise the side-panel depending on your hand size and thumb position, and there is a whopping seven buttons that can be programmed to do whatever you want. On paper this 2000 DPI mouse certainly does look like an awesome piece of hardware, as you'd expect for its hefty price-tag of £40, but it is let down by the laser sensor performance. My benchmarks show that the Perfect Control ends at a low speed of 1.04 m/s and Malfunctions not long after that at 1.15 m/s. 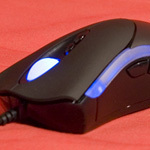 That means players with low game sensitivity will have problems playing with this mouse, reaching the skipping point and experiencing random movements when they want to turn quickly.